How to conduct an interview... it is a question that comes up often in recruiting and HR circles. First let's agree that it doesn't matter if you are doing one-on-one interviews, panel interviews, behavioral interviews or some combination, there is some commonality like needing to ask good interview questions but it is also true that not all interviews are the same. A great deal of what happens when a company talks to a candidate depends on skills of the candidate, the responsibilities of the position and culture in the company. This means conducting an interview for a CFO is different than a line manager or billing clerk. So let' begin with the best way of how to conduct an interview. Well there are elements that should go across demographics of the positions. While there is more at risk when hiring a CFO than a billing clerk, you still want to hire the best candidate possible. The skills or personality testing is always done before conducting an interview as it can factor into the questions asked to the candidate. Different companies have different philosophies on the topic of personality testing. My personal opinion is that there may be some value in certain kinds of personality test for specific jobs but on the whole they don't offer much a skilled interview can ascertain. One example where there may be some value is for a sales position where you need to know a person has the personality to take rejection and press on. It is up to you and your company whether this is valuable to you. Note: The one thing I will suggest is that if you use this type of testing, do it for all candidates. Do not selectively administer tests. It is bad policy and could subject you to a lawsuit if you are not careful! The actual interview can take shape in a number of ways, you can have 1 person sit down with a candidate and just ask a bunch of interview questions (and make sure they don't ask the illegal interview questions as well). This is a one-on-one interview. 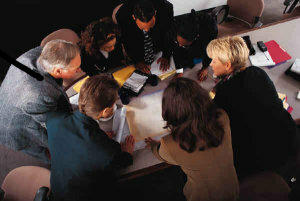 Another possibility is have a series of people involved in the process like managers, peers and HR. This can take place in a panel interview or in a series of one on one interviews. As mentioned in the section on the employee selection procedure, having a team approach can yield an excellent overall measure of a candidate. Some companies use traditional interview techniques others still will do behavioral interviews. The choice is up to you and your company. Finally before making a decision, there is often an interview assessment. This assessment is where the information gathered at the interview along with testing results is collected and reviewed resulting in a selection. If you have done the up front work, this will be simplified significantly. Once you understand the process of conducting an interview no matter if it is a panel interview, behavioral interview of some combination, if you execute properly with good interview technique and good interview questions, at the end the only thing left to do will be to make an offer and get that diamond on board and integrated into your team!